EPAULETTE X VICTORIAN MAID Filly. Foaled 3rd October 2016. 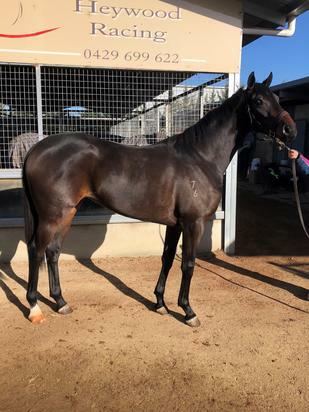 We are excited to offer you the opportunity to get involved in this well bred filly. She is showing a lot of promise, breaking in expectionally well & a smart mind on her. Epaulette is a 2x stakeswinners & 2x stakes wins with over him winning $1.7 million in prizemoney. EPAULETTE (AUS) (Bay 2009-Stud Ire. 2014, Aust. 2014). 5 wins-2 at 2, ATC Golden Rose S., Gr.1. Half-brother to SW Helmet. His oldest SH-bred progeny are 2YOs. His NH-bred progeny inc SP McMunigal, Sankari Royale and of Fas le Fios, Field of Roses, International Man, Omaha Beach, Rogue, Best of Me, Regimented, She's Different, Augenblick, Doublet, Chookie Dunedin, City Guest, Fayrouz Rose, Highest Rank, etc.